Speculations on how we got started, after a second visit to the 'cradle'. 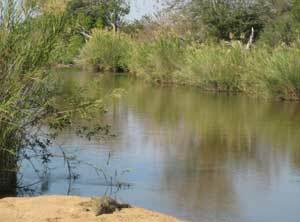 The African landscape features a great range of environments; everything from spectacular deserts to humid jungles, sometimes not all that far from each other. 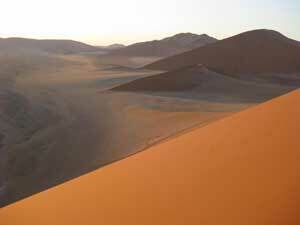 The Namibian Desert at dawn. 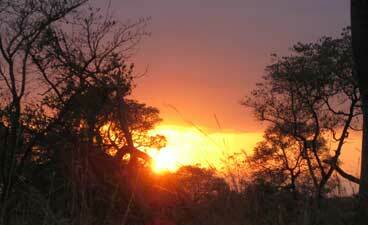 Dawn breaks in the bush, Kruger National Park, South Africa. 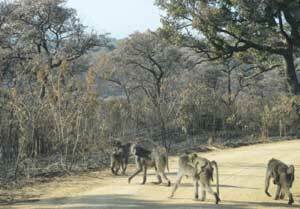 A troop of baboons head out to forage, early morning in Kruger National Park, South Africa. 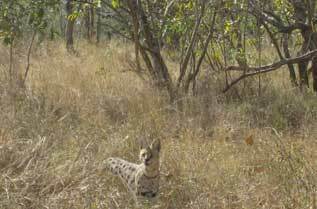 There's always somebody watching; serval cat, Kruger National Park, South Africa. Travelling through these landscapes I wonder why it is that the baboons are still living there the way they have for millions of years, yet I am driving past rubber-necking at them. Some australopithecine group, at some time in the Pliocene epoch, somewhere in Africa, became ancestral to Genus Homo. Which species, just when, let alone where it happened are among the great questions remaining about our evolution. We may never find enough fossils to fully clarify the answers. There were a number of australopithecine species during the relevant time period. We have no clear picture of how many or how they were distributed. (Listen to the interview with Francis Thackeray Part 1.) Some australopithecines were still around long after Homo appeared, and may well have been of common ancestral stock. The lines of descent may have gone along complex paths we have no trace of in the fossil record. Nevertheless the overall structure of, and evidence for, our evolution is clear. We diverged from the chimpanzee ancestors and soon started walking on two legs; Francis Thackeray suggests some of the earliest hominins, even before Genus Australopithicus, may have been bipedal. Perhaps indeed it was the moment when we parted with the chimps. It was to do with bipedalism, i.e. the decision to walk upright. And it was a decision because the option was there not to - our ancestors could have stayed foraging around on all fours like baboons still do. But they didn't. They walked upright and did it for a long time until their bodies were more or less adapted to it, even though they must have thought every day 'my feet are killing me', 'my back is killing me'. But they kept doing it, as we do today, and still must teach our infants to do so. Why? I cannot believe it was simply because of food gathering practices, or being able to see predators better - the baboons survived in the same environment without walking upright. I think our ancestors did it because of something else - something social. It made one hands free most of the time, hands free and mobile at the same time, and therefore able to carry things, especially a stick, and that gave an advantage, a primarily social advantage, that could not be let go of. This meant behaviour preceded anatomy. There is intentionality, even a certain wilfulness about it. The body was selected for by social requirements to walk. You had to walk to mate. Only after a long time did our brains start to grow. Stone tool-making, language and art came later. (left) A Ring-tailed Lemur in Pretoria Zoo, South Africa. 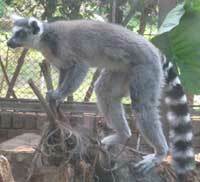 Walking on two legs seems to have a long history as the stance of this lemur in the Pretoria zoo might suggest. Early apes would have had a similar climbing posture. Apes like gibbons can go upright with great accompanying vocals. Chimps will do it to get food. But none of our other near or far relatives ever persisted with it; they only do it on occasion for a particular reason, such as a threat posture. Crocodile at waterhole, Kruger National Park. One feature of life on the savannah is central: the waterhole. It draws everyone in despite its dangers. 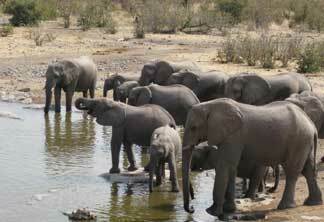 Elephants at waterhole, Etosha National Park. Walking upright, once adopted, was not enough. We had to learn to run for it too. That meant bigger chests, better coordination and more strength. 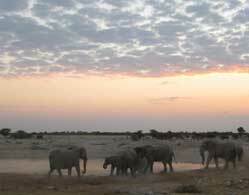 Elephants jousting at waterhole, Etosha National Park. 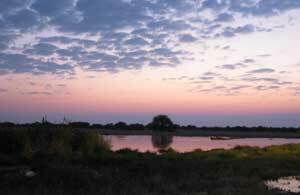 Late in the dusk at a waterhole, Etosha National Park. ...then flashes a hint of the dance it can do. I like to think those first australopithecines would watch the cranes on the savannahs that they shared. 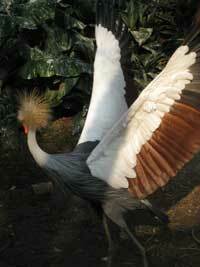 These birds did not just walk upright, they danced. Mimicry was already an established way of learning. They would have tried dancing too, and decided it was the way to go. Text © Copyright Craig Robertson, 2010, except where otherwise attributed.